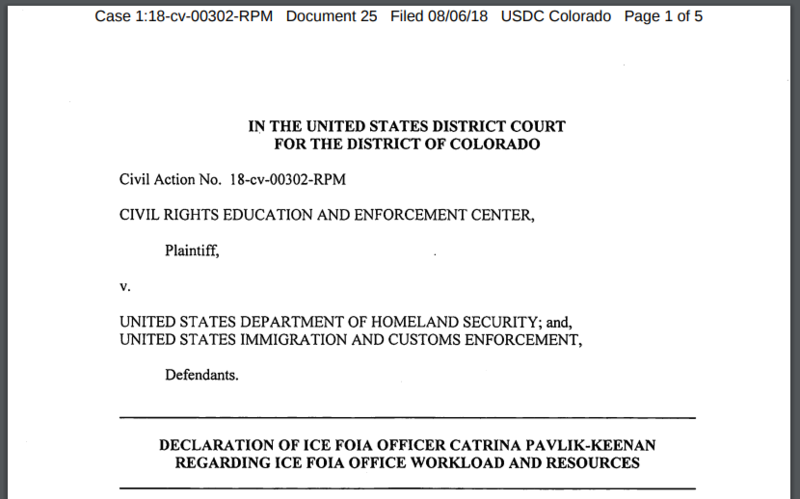 The Civil Rights Education and Enforcement Center is suing ICE for failing to respond to FOIA requests in a timely manner – to say nothing of responding within the 20-day statutory requirement. CREEC filed nine FOIA requests between August and September of last year – all concerning treatment of immigrant detainees – and has yet to receive a response. Long wait times for FOIA requests are the norm, but ICE made it nearly impossible for CREEC to even obtain the status of the requests, and did not provide an estimated timeline for completion. A court filing submitted by ICE sought leniency, citing budget cuts and noting that, as of August 2018, the agency was the defendant in 78 FOIA lawsuits and “has only assigned three ‘litigation processing unit’ employees to turn over documents at the discretion of judges in those cases. And those three employees are also being made to take up other duties.” The declaration is at odds with the agency’s FY 2018 budget, which ballooned by $2 billion in a year and does not include a line item to increase the FOIA office’s funding. Will SNAP Sales Figures be Hidden Under New (B)(3) Exemption? 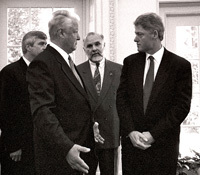 The new documentation provides a nuanced picture of some of the continuities that characterized U.S. environmental policy from Reagan to Obama, but there is clear evidence that Reagan and both Bush presidents believed that greenhouse emissions and other problems were real and that even senior aides to George W. Bush sought actions “grounded in science” and designed to encourage renewed cooperation with other countries on restricting emissions. Last week the White House and the Defense Department issued new documents on cyberspace strategy. This week, our Cyber Brief includes the new issuances and presents them with current national security and strategy documents for immediate context as well as past White House and Department of Defense documents tracing the evolution of cyber strategy in the United States Government.